Next on The Scoop: Do You Ever Bring Your Cat to Work in Your Purse? 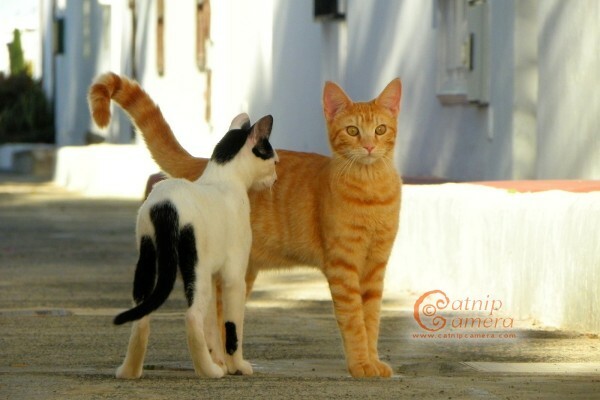 Living on the tropical island of Lanzarote, I encounter gorgeous cats wherever I go -- and I usually have a digital camera with me. From an early age I have always been crazy about cats. Maybe I was born with a cat-lover gene or something. 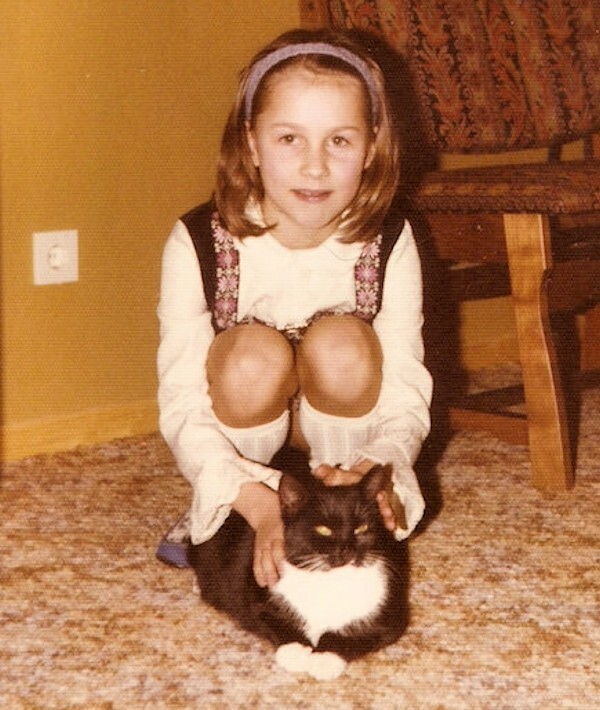 We had two cats in the family when I was young — first there was Tinka, a beautiful black and white tom who, sadly, disappeared when he was about five (we found out later from a neighbor that he had been mauled and killed by a dog). And then there was Mohrchen (loosely translated from German as “Blacky”), who was with us to the age of 14. 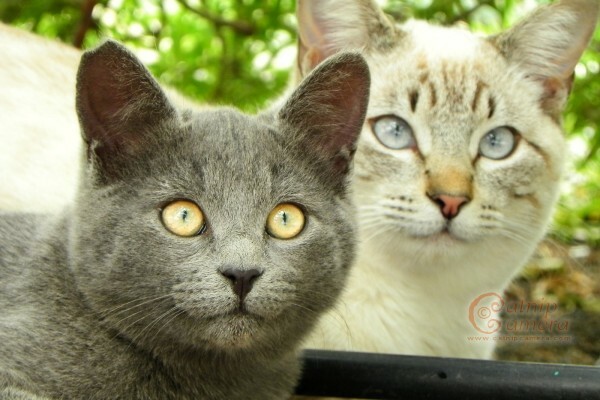 Before adopting my first very own furbabies Lugosi and Spider in March 2000, the cat deficiency in my life was relieved by volunteering for the Cats Protection League in Archway, North London, UK, every Sunday. Apart from cats, creativity is another huge part of my life. I learned to play the piano at age seven and wrote my first little tunes when I was about 10. Later on, when I wasn’t writing and recording songs, I would design logos and websites, so branching out into the creative medium of photography felt like second nature to me. I was already a keen hobby photographer before I got my first digital camera (Olympus C-100), and I had taken lots of photos of Spider and Lugosi using my ordinary old film camera. But with the emergence of affordable digital cameras, photography suddenly became so much easier — no more film to develop, nor a scanner needed in order to email those lovely photos or put them on my website. And ever since I have had a digital camera in my grubby mitts, no feline who has crossed my path has been safe from me! 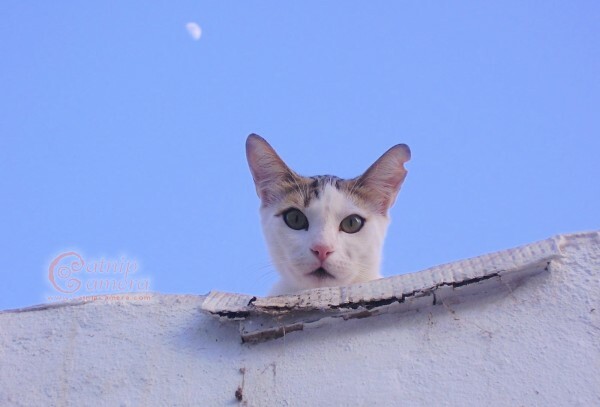 Living on the tropical island of Lanzarote, which has a large feral cat population, I encounter gorgeous kitties wherever I go — and I usually have one of my two digital cameras with me. Armed with my Nikon P100 (hopefully to be replaced by a Nikon P600 soon) or my smaller Wi-Fi enabled Samsung WB150F, I am always ready to shoot unsuspecting felines, most of whom are quite happy to pose for me, even if it’s only for 10 seconds! Big optical zoom — my Nikon and Samsung cameras have built-in 26x and 18x optical zoom respectively. These types of cameras are known as “superzoom cameras,” meaning that no additional lenses have to be attached to the front. There are now lots of fantastic superzoom cameras with up to 60x optical zoom (Nikon P600). Fully articulated (tiltable) screen — vital for taking photos in hard to get places and positions. Weight — due to suffering from arthritis and fibromyalgia pain, I cannot hold a heavy camera with one or more lenses attached to the front for more than a minute. The above mentioned superzoom cameras are very lightweight. The more optical zoom, the better I am able to get shots of feral cats who will not let me go anywhere near them. However, zooming in always requires a very steady hand since there is more camera shake. Most cameras, including my own, have rather good image stabilization sensors, though. Until I had my first tiltable screen camera I didn’t realize what a godsend this feature would become. Using this, I am able to easily take photos of cats under a table without having to crawl around on the floor. Or I can take photos holding the camera high above my head while still being able to see the screen and what I am actually taking photos of. 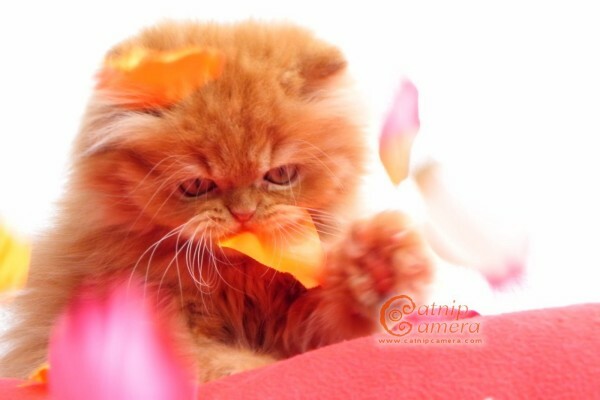 Although I’m not opposed to it, I am not so much into the “cutesy kittens in baskets” type of photography. Instead, I like trying out new angles or entice cats to do stuff or play with things, so I get really cool, and a bit more unusual, shots. When out looking for feral cats to photograph, I aim to find interesting props, shadows, branches or leaves to incorporate in my composition. Apart from that, I am a big fan of macro photography, and I love getting up close and personal with cats’ noses, whiskers or paws. 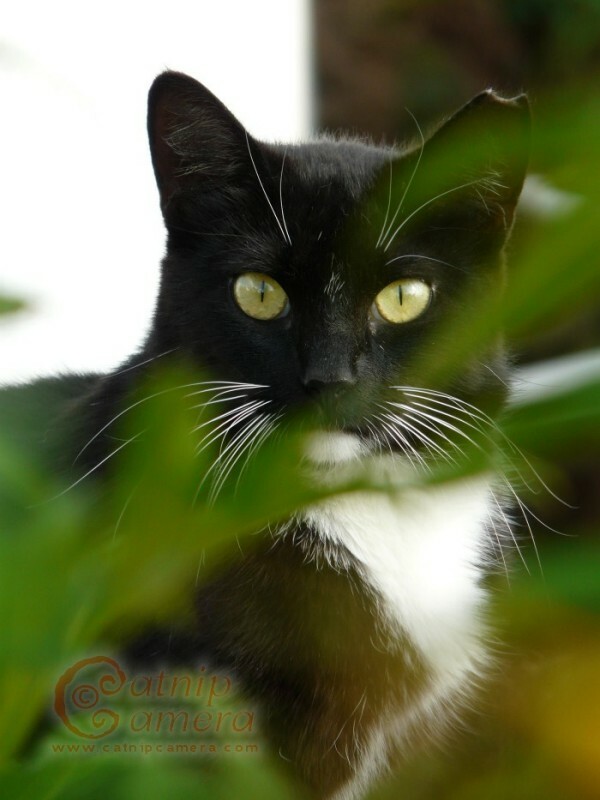 I would love to share some tips to help you get better shots of your cat. If you are in a standing position taking photos of your cat sitting on the floor, chances are that you will not get many decent photos. 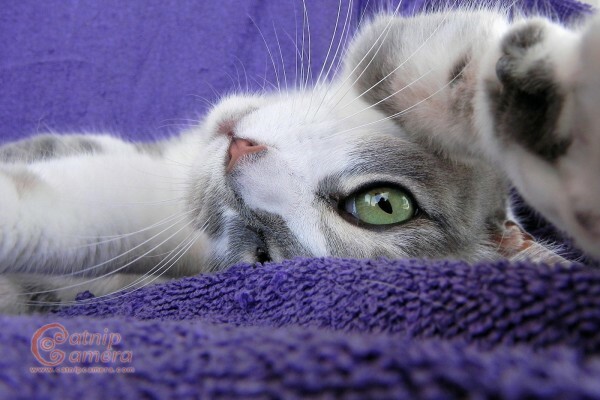 Kneel or lie down to bring the camera to the same level as your cat. This is where that tiltable screen I describe above comes in really handy! Personally, I don’t like flash photography at all. It makes everything look too harsh and 99 percent of photos end up with the dreaded red-eye effect. Or yellow-eye effect, in the case of cats. If you’re indoors, open all the blinds and curtains to let in as much light as possible, and try and move your kitty to a better lighted position if she’ll let you without ruining the moment. 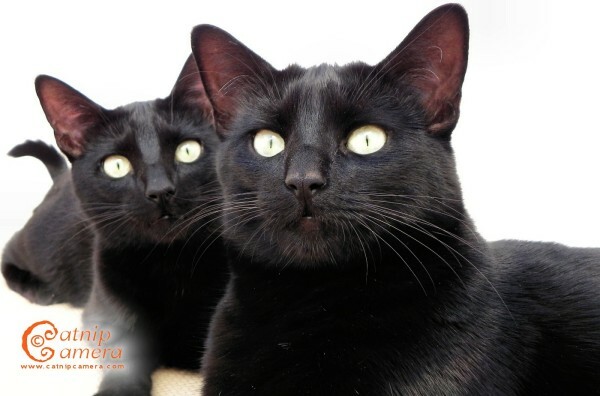 Perfect lighting is particularly important for black cats, who are notoriously difficult to get good photos of. You can also improve your indoor shots by playing with your camera’s settings, specifically adjusting the ISO which can cut down on photo blur in low light. 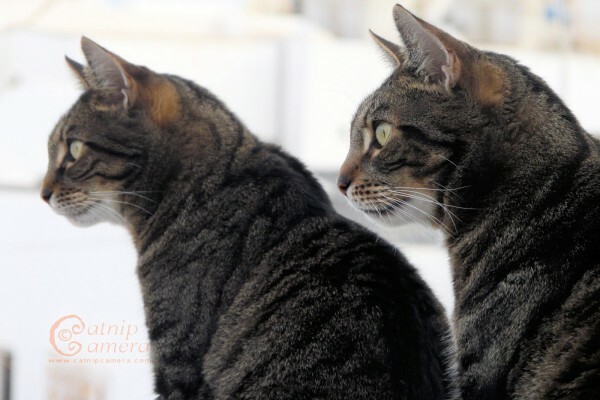 If you want to take it one step further, you might want to invest in a professional photographic lighting kit, which will help you get better indoor shots of your cats. Most of us are happy to use the automatic point-and-shoot settings on our camera, but many cameras have manual or semi-manual settings, which will really make a difference if you want to take fantastic photos. Remember, you don’t need an amazing or expensive camera — just like any good pianist can play on any piano and make it sound good, a good photographer can use a cheap, crappy camera and still take good photos. Don’t be afraid to play around with the settings and experiment! 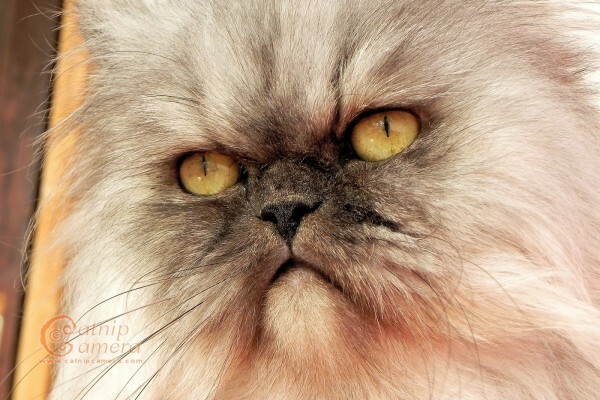 You would not want to use a tartan background to photograph a tabby cat, or a light background for a white cat. Make sure to have a bit of contrast between your cat and the colour of the backdrop. Single colors work best, but sometimes it’s all about experimenting — for example, you might want to get a camouflage effect of your cat blending in with a blanket of the same color or pattern! To get action shots of your cat with fangs and claws galore, dangle a toy in front or above her. For more encouragement, use treats as a motivator. 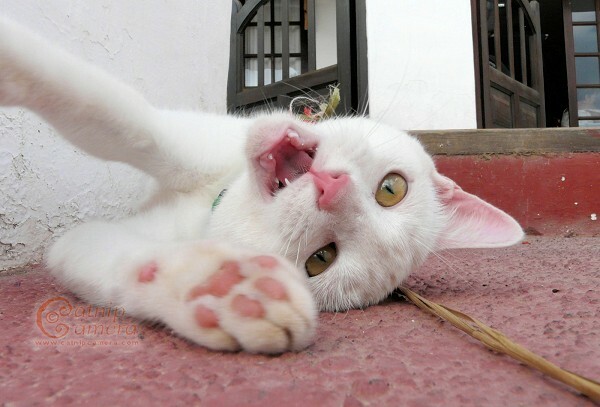 Catnip is another fantastic aid for those action shots — watch kitty go wild and snap away! Note: because of your cat’s fast movements, you might want to experiment with your camera settings, otherwise you’ll end up with a lot of blurred shots, especially in low light. So you took some great photos, but sometimes you might want to give them a colour or contrast boost, or even apply snazzy effects. There’s also the matter of an otherwise perfect shot that may have an undesirable object in the background, like a rubbish bin, that may be edited out of the photo (if you have the skills to do this). Personally, apart from sharpening and lightening my photos a little, I try to keep them as natural as possible, and for contrast and color boost I usually use the settings on my camera. Visit my website Catnip Camera to see more feline photography, and also like me on Facebook and follow me on Twitter. 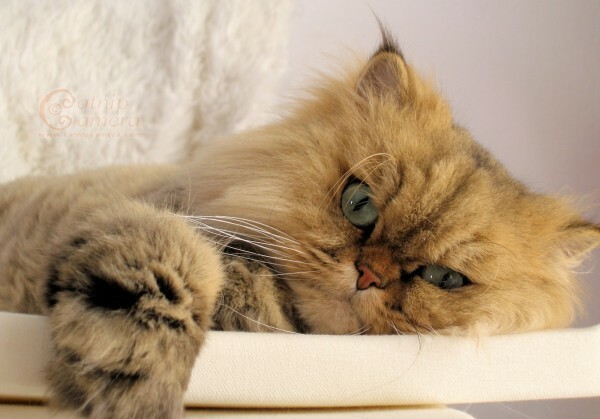 Do Your Cats Like to Have Their Photos Taken? About the Author Barbarella Buchner — Ailurophile. Geeky Goth Girl. Ex-Musician Singer/Songwriter. Photographer. Web Designer. Fibromyalgia + RA Sufferer. And totally mad! 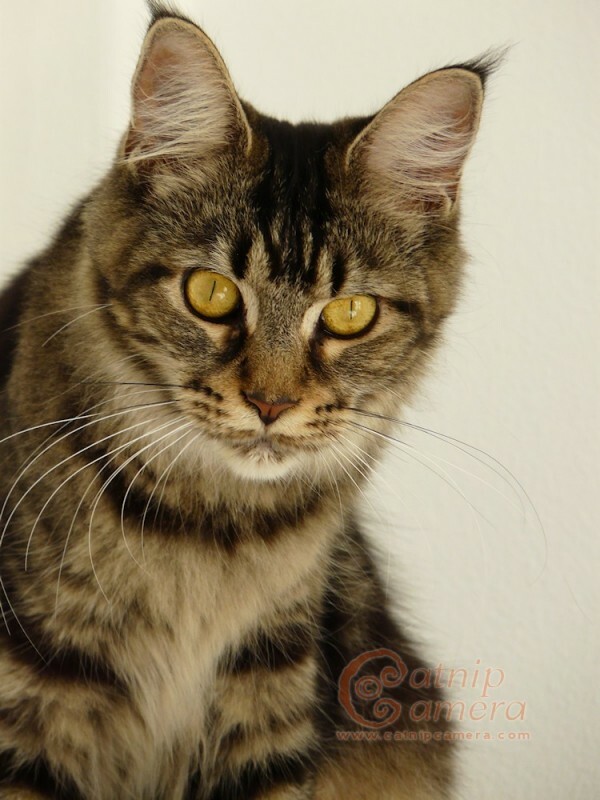 She originally hails from Hannover (Germany), then moved to London, and since 2004 has lived on the tropical island of Lanzarote, together with her tabby twins Lugosi & Spider, and ginger queen Ruby Akasha. Apart from being an avid hobby — and sometimes even paid! — photographer, she works as a freelance web and graphic designer and occasional Catster contributor. 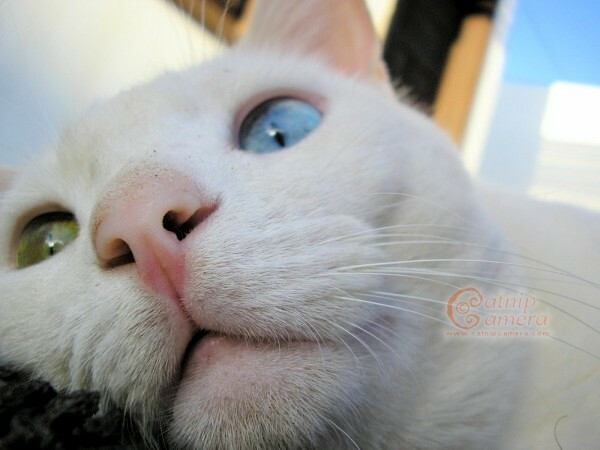 She designed and maintains her local cat charity 9 Lives Lanzarote‘s website.